This women's scarf BY HENDRIK is available in two different styles. This River Adventure scarf by Jeroen Bosch is printed with beautiful flowers in serene colours. With its length of 150 cm it is the ideal scarf that can be worn casually as well as in formal occasions. 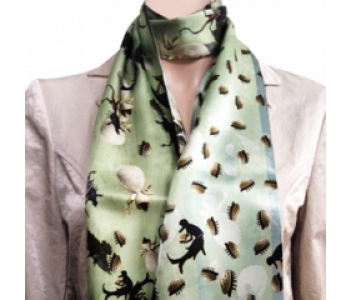 This BY HENDRIK 'River Adventure' Bosch women's scarf will complete any outfit with a piece of art. 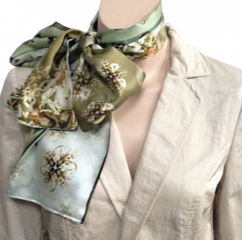 The scarf has beautiful floral and serene colours including soft green. 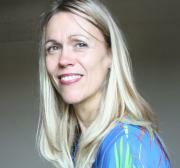 The emphasis on the designer scarves is inspired by famous paintings of Jeroen Bosch. This stylish design accessory is an asset to your wardrobe. And also important, with this scarf you'll steal the show! Every time, because the scarves have a different print on the front and the back. These designer scarves are very suitable as gifts due to their artistic and timeless design. A whiff of art to complete your outfit is a great gift to give and receive. 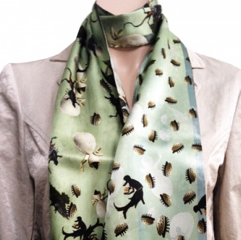 The Jeroen Bosch scarf is made from 100% silk. This makes the scarf very soft, sturdy and, above all, beautifully shiny. An asset to any wardrobe. And an excellent gift from Holland for a wedding, anniversary, birthday, mother's day, valentine's day or a farewell party. Around 1450 Hieronymus van Aken was born in Hertogenbosch. After primary school Hieronymus went to the Latin School, which distinguishes him from most of his peers. At the age of 12 Hieronymus started to practice painting on canvas. At the age of 20 he married the wealthy Aleid van Meervenne and he moved to Aleid's house on 'De Markt' in Den Bosch. His reputation as a painter grows considerably in those years, both inside and outside the city of 's Hertogenbosch and he gained respect and status and started to sign his paintings with his stage name 'Hieronymus Bosch', inspired by the city where he lived, loved, painted, died and was burried.